The Gesneriaceae are a mid-sized to large plant family comprising approximately 2500-3500 species in 120-135 genera, distributed primarily in the tropics with a few temperate species in Europe, China and Japan. The majority of species are herbaceous perennials, but they also can be annuals, shrubs, lianas, and trees. Many species (20%) are epiphytic, and the Gesneriaceae ranks among the top ten plant families in terms of absolute numbers of epiphytic taxa. The Gesneriaceae are often referred to as tropical Scrophulariaceae and are closely related to this plant family. They are also closely related to Bignoniaceae and Acanthaceae but are distinguished from these families by the combination of five-lobed corollas, parietal placentation, and presence of endosperm in most species. Figure 1. Cyrtandra hawaiiensis X Cyrtandra calpidicarpa from Hawai'i. The Hawaiian species of Cyrtandra represent an intriguing evolutionary story in that all 54 species are found only on the Hawaiian islands and have resulted in 75 interspecific, naturally occurring hybrids. The Gesneriaceae are primarily a tropical family found in both New and Old World tropics, although there are some temperate representatives in Europe and Asia. 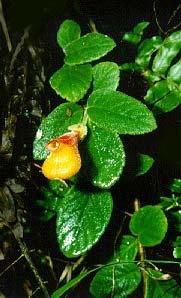 For the most part, the subfamily Gesnerioideae is found in the New World, the exceptions being members of the tribe Coronanthereae which are also found in Australia and the South Pacific. Cyrtandroideae are restricted to the Old World. Members of the tribe Klugieae, which has traditionally been placed within the subfamily Cyrtandroideae, are also found exclusively in the Old world, the one exception being Rhynchoglossum azureum from Central America. Figure 2. 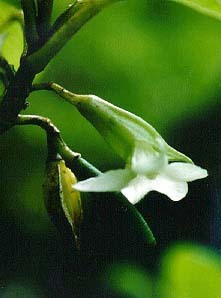 Cyrtandra oxybapha from Hawai'i, a representative of the Cyrtandroideae. Leaves are opposite in the majority of the Gesneriaceae but in many species anisophylly where the leaves are unequal in size occurs. This is sometimes so extreme that the smaller leaf is either inconspicuous or even falls off early creating an alternate leaf arrangement. 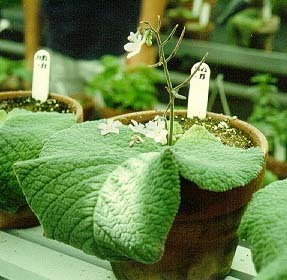 Members of the Gesneriaceae have 5-lobed corollas with fused petals. In the majority of species these corollas are long and tubular, however in some the corolla tube is shortened and flattened. The shorter corolla tube is found in the most widely known and cultivated member of this family, the African violet (Saintpaulia). Figure 4. Columnea densibracteata from Ecuador. The brightly colored undersides of the leaves are believed to act as an additional signal to attract pollinators to the contrasting yellow flowers. Another interesting feature of the Gesneriaceae is that the cotyledons do not expand equally upon germination in nearly all members of the subfamily Cyrtandroideae. 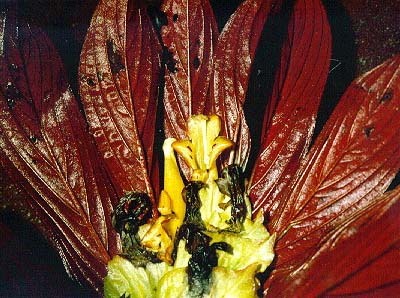 In most instances the plant will develop normally, but in Streptocarpus and Monophyllaea, the single cotyedon may become the entire vegetative portion of the plant with flower stalks arising from the cotyledon (Figure 3). Figure 3. Unequal cotyledon expansion becomes extreme in some members of the Gesneriaceae as shown here with Streptocarpus. The cotyledon is the entire vegetative portion of the plant. Classifications of the Gesneriaceae traditionally recognize two subfamilies (Gesnerioideae and Cyrtandroideae). The division of the family is largely based on the uniform (Gesnerioideae), or uneven (Cyrtandroideae) enlargement of the cotyledons after germination (Burtt,1962). Another character that has been useful in separating the subfamilies is the presence (Gesnerioideae) or absence (Cyrtandroideae) of endosperm in the seed. The two subfamilies have been divided further into 9-17 tribes. The tree presented here is based on a cladistic analysis of DNA sequences. The aim of this work was to resolve more clearly the phylogenetic relationships among taxa and to propose a more stable classification scheme. The two subfamilies have been identified as monophyletic and the tribe Klugieae (Cyrtandroideae) appears to be separate and sister to the remainder of the family. The traditionally recognized tribes Trichosporeae and Didymocarpeae are not monophyletic in this analysis and are represented here by several different lineages. The Trichosporeae are monophyletic in an analysis of morphological data whereas the Didymocarpeae were also polyphyletic (Smith 1996). These two tribes will need further investigation although the Didymocarpeae is such a large heterogenous group that dividing it into smaller groups is probably the best solution. The relationships presented here are comparable to studies based on morphological data (Smith 1996), the main exception being that the subfamily Cyrtandroideae was found to be paraphyletic. The Klugieae were also found to be the sister to the remainder of the family in this analysis. A combined analysis of morphology, ndhF gene sequences and rbcL gene sequences differs in the placement of the Klugieae, however; rather than being the sister of the remainder of the family, this group is in its traditional place as a member of the Cyrtandroideae. BOGGAN, J. K. 1991. A morphological study and cladistic analysis of Sinningia and associated genera with particular reference to Lembocarpus, Lietzia, Paliavana, and Vanhouttea (Gesneriaceae: Gloxinieae) M. S. thesis, Cornell University, Ithaca, NY. BURTT, B. L. & H. WIEHLER. 1995. Classification of the family Gesneriaceae. Gesneriana 1: 1-4. CRISCI, J. V., M. M. CIGLIANO, J. J. MORRONE, & S.ROIG-JUÑENT. 1991. Historical biogeography of southern South America. Syst. Zool. 40:152-171. INNIS, M. A., K. B. MYAMBO, D. H. GELFAND, & M. A. D. BROW. 1988. DNA sequencing and direct sequencing of polymerase chain reaction-amplified DNA. Proc. Natl. Acad. Sci., USA 85: 9436-9440. IVANINA, L. I. 1965. Application of the carpological method to the taxonomy of Gesneriaceae. Notes Roy. Bot. Gard. Edinburgh. 26: 383-402. KVIST, L. P. 1990. 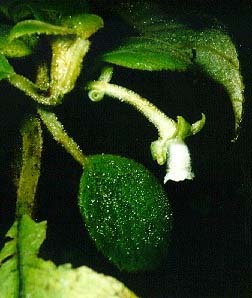 Revision of Heppiella (Gesneriaceae). Syst. Bot. 15: 720-735. SMITH, J. F. 1996. Tribal relationships within the Gesneriaceae: A cladistic analysis of morphological data. Syst. Bot. 21: 497-513. SMITH, J. F. & K. J. SYTSMA. 1994a.Evolution in the Andean epiphytic genus Columnea (Gesneriaceae):Part I. morphological variation. Syst. Bot. 19: 220-235. SMITH, J. F. & K. J. SYTSMA. 1994b. Evolution in the Andean epiphytic genus Columnea (Gesneriaceae): Part II. chloroplast DNA restriction site variation. Syst. Bot. 19: 317-336. SMITH, J. F. & K. J. SYTSMA. 1994c. Molecules and morphology: congruence of data in Columnea (Gesneriaceae). Pl. Syst. Evol. 194: 37-52. SMITH, J. F., J. C. Wolfram, K. D. Brown, C. L. CARROLL, & D. S. DENTON. 1997 Tribal relationships in the Gesneriaceae: Evidence from DNA sequences of the chloroplast gene. Annals of the Missouri Botanical Garden 84: 50-66. SMITH, J. F., K. D. BROWN, C. L. CARROLL, & D. S. DENTON. 1997. Familial placement of Cyrtandromoea, Titanotrichum, and Sanango: Three problematic genera of the Lamiales. Taxon 46: (in press). WANG, W.T., K. PAN, & Z. LI. 1992. Keys to the Gesneriaceae of China. Edinburgh J. Bot. 49: 5-74. WIEHLER, H. 1983. A synopsis of the neotropical Gesneriaceae.Selbyana 6: 1-249. This plant demonstrates the long, brightly colored corolla common in the neotropical members of the Gesneriaceae. Page: Tree of Life Gesneriaceae. Authored by James F. Smith. The TEXT of this page is licensed under the Creative Commons Attribution-NonCommercial-ShareAlike License - Version 3.0. Note that images and other media featured on this page are each governed by their own license, and they may or may not be available for reuse. Click on an image or a media link to access the media data window, which provides the relevant licensing information. For the general terms and conditions of ToL material reuse and redistribution, please see the Tree of Life Copyright Policies.